Android devices have never enjoyed much love from audio docking makers, which is probably why my home stereo system is still powered by my iPod. But with so many different devices and even different plug standards, OEM's also haven't make it very easy for anyone looking to develop audio systems for the Android community. Especially Samsung with their proprietary plug system has toss more then a few stumbling blocks in the way of anyone looking for develop add-ons to their successful tabs. 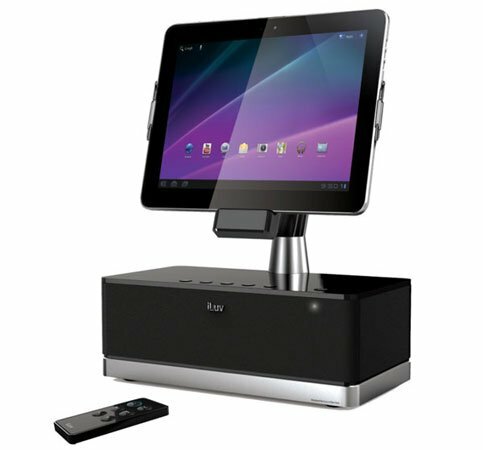 But now iLuv has announced the iSM524, a high quality docking station, for a high quality tablet. As you can see from the picture, this isn't a cheap affair. The docking station will set back tab owners $149 but appears to present a major plus to most other audio solutions for the Galaxy Tabs. I saw appears because the official iLuv press release forgot to include any specs whatsoever so it's anyone's guess what the sound quality will be. That being said judging by the visuals alone, the home unit should pack a decent punch. The iLuv docking station is compatible with the Samsung GALAXY Tab 7”, 7.7”, 8.9” and 10.1” and comes with a remote control which could make the tab/docking station combo a nice replacement for home media system.